On Sunday 5th June LBC went to Peterborough with a full trailer as is often the case these days. Today was a 1k multi lane course and first off were the Ferris sisters who battled against the headwind but lost out in a time of 5.11, Hannah later went on to row with Alex in the open category with a time of 4.50 but no win this time. 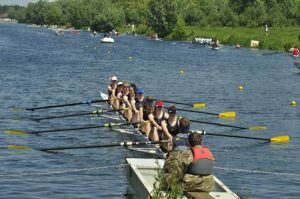 Women’s novice sculler Charlotte in her first multi lane event had a great race but just missed out on a win in a time of 5.20, she then competed with other first time sprinter Ellena in the WIM3 8+ with team mates ‘Jenerator’, Annie, Cathy, Erica, Zoe and Emma coming 3rd in a time of 4.06. Mike raced his single and was then joined by Scott for their masters double with times of 5.09 and 4.55 respectfully. Erica and Zoe raced their masters 2- and despite a little ‘rest’ on the way down managed not to come last with a time of 4.54! We had to wait ’til late in the day to see some silverware but it was worth the wait! 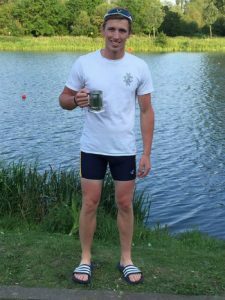 Tom Scholefield, despite having had a hard race at Met regatta the previous day, got through his morning heat in a time of 3.57 and went on to win the Elite 1x event in a fantastic time of 3.53 – well done Schofey.